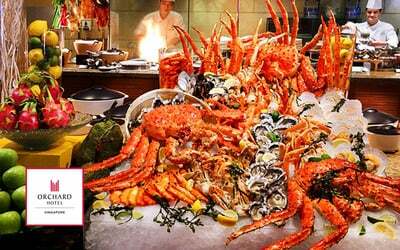 Dine out in style when you dig into the riches of Orchard Cafe's international lunch buffet spread! Tantalise your palate with a venture into local, Asian, and Western fare with a menu of delights sure to fill rumbly tummies. Valid Sat – Sun: 12pm – 2.30pm.Valid on public holidays and eve of public holidays. Not valid with other offers / promotions / discounts / credit card. Seating and selection of seats in the restaurant will be at the sole discretion of the restaurant management.